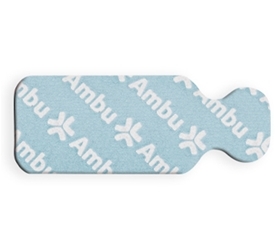 The Ambu® WhiteSensor Pediatric Small Tab ECG Electrode – item #0215M, item #EM0215M is a skin friendly, solid gel electrode with a center tab connection for great adhesion and reliable recordings. This electrode can remain on the patient during x-ray and MRI procedures. The Ambu® WhiteSensor Pediatric Small Tab ECG Electrode – item #0215M, item #EM0215M is sized, 13mm x 34mm. It has a polymer backing material and is PVC free. It conveniently, each pouch of 100 has 10 electrodes per strip, and is sold 500(5pouches)/box and 5000(10 boxes)/case.